Starbucks is now testing electronic redemption of free drink coupons as part of MyStarbucksRewards. 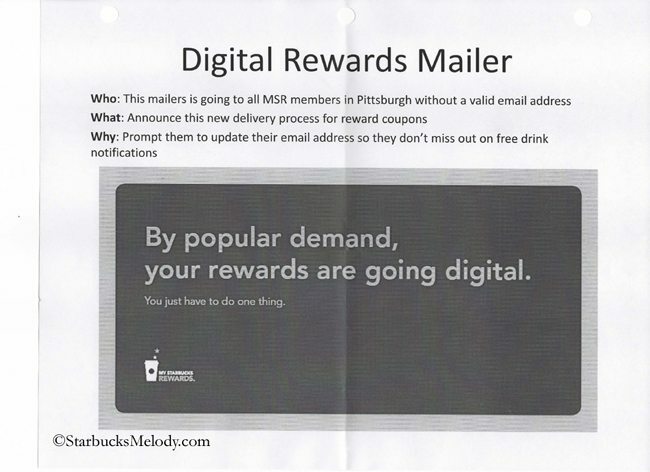 Beginning on April 23, 2012, Pittsburgh is the test market for digital rewards. Pittsburgh customers can sign up for this. The customer will receive an email when a free drink has been earned, and then simply can go into the store with his or her registered card to redeem the drink. Just as a reminder, Starbucks mails a postcard for a free drink out to customers, but this has been met with complaints that cards were lost, damaged, mis-delivered, or for one reason or another, never arrived at the card holder’s address. For those who do not know about MyStarbucksRewards, here’s a basic overview: A customer gets a Starbucks card (it can be ANY of the free gift cards), loads money on it, creates a profile at Starbucks.com/card registering the card, and then uses it to pay for purchases. After five swipes of a card registered to the Starbucks.com/card profile, the card holder is elevated to “green” level where an enormous number of perks kick in, including free soy milk, a free tall beverage with the purchase of a pound of beans (or half pound of Reserve) and more. I have been meaning to write a lengthy blog post just about the “green” level of perks but first I wanted to talk to someone at the Starbucks headquarters about areas of ambiguity that I am still unsure about. I am sad to report that despite more than one attempt, I have had no luck getting a Starbucks card/loyalty partner at the SSC to contact me for this, but I am still working on it. After 30 uses of a card, a customer is elevated to the “Gold” level of benefits. I should be clear that it is possible to register more than one card to your Starbucks.com/card profile, and it is quite possible to use multiple cards, and still receive all your perks. The benefits of MyStarbucksRewards are rewarded per Starbucks.com/card profile and NOT per any specific card. At the “Gold” level of benefits, a customer receives in the mail a shiny gold card with his or her name on it. There is no requirement to actually use that specific gold card. One can keep using his or her favorite card from before. After reaching the “Gold” level of benefits, a customer earns a free drink coupon for every 15 swipes of the card. 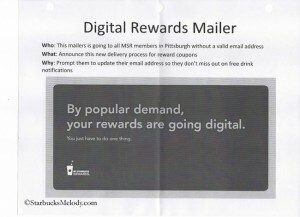 The free drink coupons are what is at issue in this blog post – Pittsburgh gets them digitally now! By the way, please know that the MyStarbucksRewards are actually a little different from place to place, so the discussion above only pertains to the U.S. version of MyStarbucksRewards. How is this working out? Is there anyone reading this who is within the test group? How do you like the electronic rewards? I would love to hear how this is working out or your thoughts on this. Starbucks stores with the Iced Peach Tazo Tea test: The displays and signs. In testing: Starbucks new Evolution Fresh Smoothies – Baltimore & San Diego. Claudine, you have a nice blog! Lots of Starbucks China content! It’s fun to see what is offered over there – Stickers for your Starbucks card? That’s definitely interesting. Thank you for weighing in. Do the digital rewards work well in China? I was doing some rearranging in my “office” yesterday and found 12 Sweet 15 cards from 2010 that I had not redeemed 🙁 , what a waste. Makes me wish more and more for the old simple days of the 10% discount. Ugh! What a shame. Maybe not worth it, but Dad Cooks I would maybe go to your local SB and see if perhaps they would redeem them for you or even call customer service and see what they say. Could be more aggravation than needed but it also might be worth a try. I too wish the 10% discount returned. I know you posted this blog some time back (!!) But I have a question….. If you receive a reward from Starbucks does it automatically get redeemed when you buy say your next drink or food? On a further point, currently if you order 1 drink you get 1 star. If you order 10 drinks at the same time, you get 1 star…. not fair!! It is stars per transaction. I can easily agree that I’d like to see a system where stars were weighted by the total value of the transaction. It doesn’t look like that will happen. You can ask for the register barista to ring things up separately. Personally, I live near like 20 Starbucks (that’s not really an exaggeration), so sometimes I’ll just walk from one to another – I want to say to certain baristas, and I’ll get a beverage at one store, and food at the next one, a block away. I started doing that a long time ago, and it came out of wanting to say hello to a number of people. In any case, I can totally agree that stars weighted by transaction would make some sense – but it doesn’t seem like that is going to change. You will also receive a star per swipe at the Evolution Fresh juice stores (there are four of them), and at the one Tazo Tea store here in Seattle.